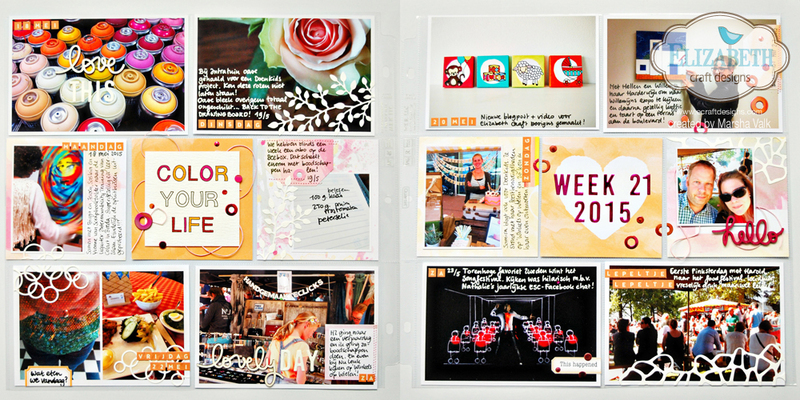 Elizabeth Craft Designs | Project Life Spread – Marsha. 31 May 2015 30 June 2015 | Marsha. There’s a new Designer Challenge up on the Elizabeth Craft Designs Blog. This time it’s all about the new background dies! I love these dies… They’re awesome for card making, but also perfect for mixed media projects and scrapbooking. Which means they’re also perfect for pocket page scrapbooking! If you are a regular reader here, you know that I have a love/hate relationship with Project Life. I think it’s just a case of figuring out how to make it work for me. But until I take the time to do just that… I’d better try and use my stash (not a ton, but enough) of pocket page scrapbooking product before I fall out of love with it! One of the kits that has been in my stash FOR MONTHS now is the beautiful Watercolors Project Life kit from Scrapdelight. It looks like the Watercolors kit sold out, but the shop offers a new exclusive pocket page kit each month and there is also a subscription option called [Document] Life Stories. In fact: there is a new kit coming out June 5th. Each kit is exclusively designed for Scrapdelight and it comes with carefully chosen colour-coordinated embellishments by for example Little Miss Evie. Which of course means that all the thinking has already been done for you… So you can just start (pocket page) scrapping! I used the Elizabeth Craft Designs background dies to create overlays for some of my photos and cards. I also die-cut words for the titles with the ECD Alphabet and Numbers dies and I used all the re-enforcement holes and small circles from my ECD Tag die sets to create ‘sequins’ out of Shimmer Sheetz.